It’s official! People love to hear about other people’s sassy and narcissistic teenagers. One of my recent posts about “Upgrade Me Grace” broke my humble little blog’s record for “Most Widely Read Post.” Obviously, that motivates me to write more blogs about the Life-and-Times-of-Gracie, but I promised myself I would bide my time and space them out a bit. She really was such a good sport about the recent post, (where I compared her presence in our home to a disruptive weather pattern) Still… I don’t want it to seem as though her very own mother is picking on her. Nonetheless, when she called me the other day to tell me that her college transcripts were “frozen” and she just needed my credit card number REALLY QUICK to pay the school for a couple of “INCIDENTALS,” I experienced an immediate change of heart…. After my *INITIAL REACTION, I thought to myself, ‘It’s one thing when my kids screw up and cost me money needlessly, but it’s another thing to forgo capitalizing creatively due to voluntary imposed self-censorship.’ Literally, the only compensatory thing about raising teenagers is that they provide excellent writing material and fodder for the blog. Their behavior continuously elucidates everything parents despise about the age 12-21 demographic. One quick phone call confirmed that those INCIDENTALS were parking citations. One was for $85 and the other one was for $50. It appears as though at The University of Arkansas there are 2 types of parking infractions-Misdemeanor Parking and Felonious Capitol Offense Parking. It looks as though the $50 parking MISDEMEANOR was for parking her car in an “unauthorized space.” But, the $85 one specifically notes on the citation, that there was “signage expressly forbidding”her to park in said space. …and yet, my daughter interpreted this to mean “This is Negotiable” and scooted on in. To receive a fine as steep as $85, she had to have commandeered the private parking space of someone pretty high up the University Food Chain. Perhaps the sign said, “Dean Parking” and she thought it said, “Queen Parking”. In our family, It goes without saying, that you are responsible for paying any and all fines you incur, but I went ahead and said it anyway. As soon as my money effectively thawed out her academic record, I promptly informed her that she would be reimbursing me the $135. She balked for a few minutes informing me that, “everybody gets these” as if to imply that parking tickets were just part of the CUSTOMARY AND REASONABLE expense of any undergraduate degree and a prudent parent would’ve budgeted for this expense. I can’t wait for her to finish up her exams and move home to start her summer job, so she can pay off her debts to society (Me). A. Hang on, Sweetheart, let me grab my Checkbook! B. Will they take my debit over the phone? C. Is there Campus Jail, where student can serve time, in lieu of parent paying fine? My college queen also thinks the rules don’t apply to her! The first time her car was TOWED was because she didn’t think they would really tow her because she forgot to put her sticker in her car – even though the sign reads ‘residents only – stickers required – cars without stickers will be towed.’ The SECOND time her car was TOWED was because my super studious girl pulled an all-nighter studying at the library and didn’t move her car before 8:00 AM. 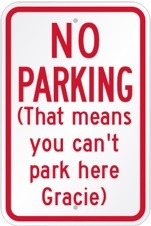 I guess she thought students who wait to study until the last minute and have to study all night don’t have to obey the NO PARKING between 8-5 signs! There is a reason God gave me boys. That reason is patience. It is a virtue that I was not blessed with. My quiz answer is definitely C. Campus jail. However, given a second thought you smartly realized that you would have to drive yourself to Fayetteville to have said daughter bailed out, hence pulling out the credit card anyway. You are always thinking Leslie. I just started following your blog. And… it just so happens that I can relate to almost everything…..especially this one. I have two ginger sons. The youngest is a freshman in college this year and went to fight a parking ticket yesterday. It was his fourth or fifth ticket so far, and of course, it is never his fault. But this time he went to fight it with the campus parking appeals board because he had proof that he should not have gotten this ticket. Apparently, there were no signs or markings of any kind by where he parked. I told him to be nice and state his case calmly. Today he found out they dismissed his ticket. I told him that he must have impressed the board just by showing up. He responded by saying it was his ginger charisma that did it.